We had loads of fun hosting games and sharing treats with our little friends at Beecher Hills Elementary! 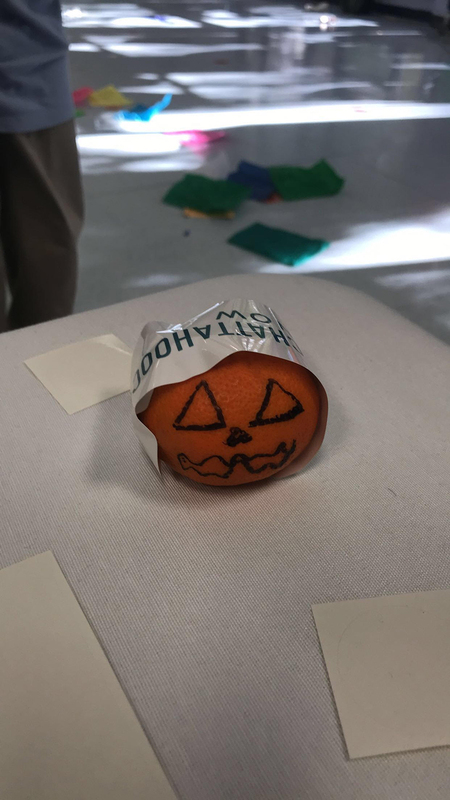 100 kids participated in our games which included a witch's hat ring toss, ghost pillow-case-race 'on the Hooch,' punch the pumpkin candy cups and decorate your pumpkin (tangerine). Beecher Hills Elementary is located adjacent to Utoy Creek, a PATH trail and an Atlanta Beltline spur in southwest Atlanta. Utoy Creek flows directly into the Chattahoochee River. Thank You Beecher Hills for inviting us to your annual fall fest! Excited to attend and support Ray Day 2017 at Serenbe! On October 5, 2017 we hosted at Manuel's Tavern our Stakeholder's Preview of our equity report. Our vision is equitable access to the river. Our report (below) provides both existing data that highlights current inequities and recommendations to combat displacement during future revitalization along the river. Our amazing stakeholders in attendance were: Trust for Public Land, City of Atlanta, Invest Atlanta, Park Pride, Atlanta Regional Commission, Ray L. Anderson Foundation, US EPA, Chattahoochee Riverkeeper, Atlanta Beltline, Inc., Chattahoochee Nature Center, City of Chattahoochee Hills, The Nature Conservancy, City of Smyrna, Riverwalk Atlanta, EW Resources and HL Strategy. On Saturday, September 23, 2017 Chattahoochee NOW hosted a park cleanup. Thanks to our board members, Park Pride, Groundworks and volunteers we worked for four hours clearing, picking up trash, cutting weeds and helped stabilize the river bank. We offer our condolences to the family of Preston Mason. Preston tirelessly volunteered at our cleanup and has been a strong supporter of river revitalization. For additional information, visit gloATL and recent AJC article. Thanks to Southface Institute for hosting Chattahoochee NOW’s Executive Director, Shannon Kettering, and board members Walter Brown (co-founder) and Katharine Wilkinson. Southface’s roundtable convenes once a month to discuss the region’s current environmental issues – from water to energy, urban planning to government policy, and much more. Members of the audience are encouraged to ask questions, make comments, network, and learn about Atlanta’s current and future opportunities for sustainable development. This was the first opportunity to present Vision53: Discover Your Hidden Riverfront since its launch in March, and we thank the attendees for their interest and questions. We hope you will continue the conversation with us on Twitter and Facebook: @rivernow53 and Facebook.com/ChattahoocheeNOW. And continue to let us know how YOU want to discover your way to the river by using #ourATLriver on social media. Let's discover our life on the Chattahoochee riverfront! Our board had the privilege of getting a firsthand tour of the many successes of the French Broad River’s revitalization thanks to the hard work of RiverLink – the nonprofit that is spearheading the economic and environmental revitalization of the French Broad and its tributaries, as a destination for everyone to live, learn, work, and play. Led by Amy Annino, Watershed Resources Director, the board had the chance to see the benefits of public access (even just simple stairs), reclaiming former vacant lands for parks (and festivals), and the ripple effect of having an amenity as beautiful as this one in your backyard (brewpubs, artist markets, outfitters, and thriving businesses along its banks). While RiverLink, founded in 1987, has been at this a wee bit longer than us, it was inspiring to see that they too started with a vision – to have live, work, play along their mightiest resource. Bringing it to life depends on continued cultivation of awareness and creating reasons to come to the riverfront, to get folks invested. We are up for the challenge, Atlanta! Where the F*** is the River? SOLD OUT event launches Vision53! Chattahoochee NOW’s Vision53 plan was unveiled on March 2nd by Ryan Gravel to a sold out crowd at Dad’s Garage Improv Theatre in O4W, Atlanta, GA. During the aptly named Where the F*** is the River? event, Ryan donned waders and walked the crowd through the history of river revitalization efforts nationally, culminating in the vision for the Chattahoochee Corridor. The Chattahoochee riverfront doesn’t look like most of the world’s revitalizing waterways. So, too often we say Atlanta doesn’t have a river. We do. It’s different. And in many ways, it’s better. Yet, Atlanta’s Riverfront is Hidden. To uncover the hidden opportunities of the 53-mile stretch of riverfront that lies downstream from Sandy Springs, we need to see our river differently, and we also need to get there. That is our Vision53, which we are kicking off with four objectives. Ultimately, we hope they lead our region toward investment in a new 5,000-acre “working park” along the river, encompassing a protected and interconnected network of farms, forests, new parks, and nature preserves. THANK YOU to the Ray C. Anderson Foundation for their support – and to the over 250 attendees that joined the effort to support Chattahoochee NOW. We will discover our hidden riverfront together! October 2015 was an exciting month for Chattahoochee NOW and our region becuase we kicked off our work with Ryan Gravel and his new firm, Sixpitch. Under Ryan’s direction, we set out to define a big, broad vision for the Chattahoochee Corridor – Vision53. We thank the Ray C. Anderson Foundation for the generous grant that allowed us to engage in this important work. We began to organize immediately around overlapping themes like Ecology, History, Access, Connectivity, Economy, and Urban Development. From that, a framework emerged, helping us to structure thinking and organize ideas. Development of themes and ideas relied heavily on feedback obtained over the preceding 30 months by Chattahoochee NOW, built upon with research, fieldwork, analysis, and importantly, illustration. Chattahoochee NOW and Sixpitch have also invited community leaders and partners to join us in vetting the initial framework and its core ideas, offering valuable inputs that will refine the final document into a clear, inclusive, and actionable vision for our river corridor. Chattahoochee NOW is pleased to have been invited to participate in RayDay at Serenbe on October 11, 2015. With sunshine and hot air balloons, Chattahoochee NOW enjoyed meeting other learning booth participants and festival attendees, while asking questions such as: The Chattahoochee is just 5 miles from where we are standing, what do you wish you could do on our near the Chattahoochee that you can't do today? Thanks to all who filled out our cards and wished us success! We appreciate the Ray C. Anderson Foundation for the opportunity to join in celebrating Ray’s life and legacy! October 7, 2015: Thanks to all who joined us for happy hour on the rooftop of Big Sky Buckhead to enjoy cocktails and conversation about #ourATLriver. 40 guests enjoyed appetizers and a gorgeous evening while answering a few provocative questions, such as: Today, the Chattahoochee is Atlanta’s waterway, but it isn’t our way of life. What’s an idea you have to connect Atlanta to our river? THANK YOU to Big Sky Buckhead (what a venue! ), board members Ryan Noonan, Stan Bouckaert, and Katharine Wilkinson for your ideas and planning, as well as Lee Kolber, Shani Boston, John Hardman, and John Raulet. We hope to be back up on the roof again soon! September 2015: Chattahoochee NOW hosted 25 special guests on a half-day fun- and fact-filled guided tour highlighting the past, present, and future Secrets of the 53-mile Chattahoochee River Corridor. Guests joined us in discovering the sights, sounds, and history of our region’s riverfront…many of which had remained secret until NOW! From battles of the civil war, to a hidden festival venue, to a sporting retreat, the 53-mile Chattahoochee Corridor surprised our guests, opening their eyes to new places along the river. Under clear blue skies, we visited 4 sites: Riverview Landing in Smyrna, the site of the Tomorrow World Festival in the City of Chattahoochee Hills, Foxhall Resort and Sporting Club in Douglas County, and a Civil War battlefield within the Riverline Historic District in Cobb County. THANK YOU to Roberta Cook and Micheal Shaffer, the Merrill Family, the Bouckaert Family, Commissioner Ron Fennel (City of Smyrna), Jamestown Properties, Lanier Transportation, and Food for Thought Catering. A special recognition to all of our board members and the Partnership Committee for a great event! May 16, 2015: Chattahoochee NOW teamed up with Cities of Purpose and The Contemporary to host a civic dinner event that convened collective imaginations to dream big about the future of the Chattahoochee Corridor. Over a family style meal, we invited guests to tell stories of their river memories, share their perspective on our relationship to the Chattahoochee today, and envision different futures for #ourATLriver. For example: Imagine you’re given the ability to chart the course of one section along the river, what would you do with it? What’s your wildest idea? The event was attended by young leaders from across the city, who produced over 100 bold ideas to be integrated into Chattahoochee NOW’s vision work going forward. In May 2015, The Georgia Conservancy and Professor Richard Dagenhart presented the outcomes of the Georgia Tech School of Architecture Blueprints for Successful Communities Studio: The 53-mile Chattahoochee Corridor. With nearly 70 stakeholders in attendance at the Museum of Design Atlanta (MODA), Katherine Moore of The Georgia Conservancy, Professor Richard Dagenhart of Georgia Tech’s School of Architecture, and graduate students presented high level concepts and overarching themes for the 53-mile Chattahoochee River Corridor (from Peachtree Creek in the City of Atlanta south to Chattahoochee Bend State Park in Coweta County) developed during a three-month studio. From observation towers to trolley connections, the students offered ideas that are both far-reaching and achievable. To learn more about the students’ big ideas, see coverage in Creative Loafing: Could the Chattahoochee River become Atlanta’s waterfront?